This menu is part of the page "Zagan Cross" on "www.AvalonsTreasury.com". According to the book "Ars Goetia" the Zagan Cross helps in transforming things. This "forbidden" pendant is a key to our subconsciousness and even the word "forbidden" itself lures us to the more mystic, magic and darker aspects of our soul which we often, contingent upon society, reject as pure fantasy. In this pendant archetypical pictures are combined with seals and sigils imaged in old grimoires to create a powerful magic talisman. In the Ars Goetia the biblical King Solomon describes that the Zagan Cross increases your clear intellect and gives you the power to change water into wine and metals in to coins. Furthermore even fools are said to become wise with the help of this seal. This cross is based on the seal of the demon Zagan described in the magic book of Ars Goetia. It is helpful if the sign you want to charge carries a seal in order to keep away negative powers from the ritual and to protect you. You should wear the sign for some time in order to get familiar with the magic powers of its seal before going on with this charging ritual. In a quiet room prepare a table with a white tablecloth and take care to have ready a white candle with a candle holder, joss sticks or incense cones, a glass of water and a dash of salt. Make sure you will not be disturbed and black out the room: Put the glass of water, the white candle and the incense in the middle of the table, then ignite the candle and the incense and place the sign next to them. Now close your eyes and meditate for some minutes over the meaning of the sign and thereby imagine its effects as clearly as possible. Move the sign through the smoke of the incense - thereby it is purified by the element air. Then hold it above the flame of the candle - thereby it is purified by the element fire. Now take a dash of salt, put it in the water and imagine how the glass is filled by a golden light. Sprinkle the sign with the water and imagine that it starts to shine golden too - thereby it is purified by the element water. Finally disperse some salt over the sign - thereby it is purified by the element earth. Take a seat, close your eyes and hold the sign in your hand. Imagine a glowing sphere, consisting of shining white light, just right above you - feel the power and size of this sphere. Visualize a beam of golden light emitting from the sphere, going through your head right to your solar plexus, thus filling your whole body with this golden light which warms and strengthens you. Imagine once again the meaning and effects of your sign and let the light flow through your arm into your hand and from there into your sign. Take a drink or eat a meal in order to recover - this way your body is led back into this world. The sign will stay charged as long as you keep it close to your body. After charging you hold a very powerful symbol in your hands which can cause deep changes in your life. If the effect of the sign is undesirably strong you can discharge it by holding it under running water and imagining for a few minutes how the energy is leaving the sign. This jewelry belongs to the jewelry line up "Forbidden". 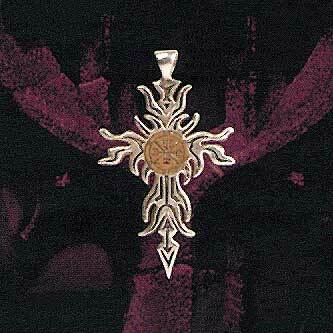 Page: According to the "Ars Goetia" the Zagan Cross bestows wisdom to its wearer.